Knowingly or unknowingly every one of us pays taxes to the government every day, Both Tax Deducted at Source (TDS) and Tax Collected at Source (TCS) are part of the direct taxes and income taxes. 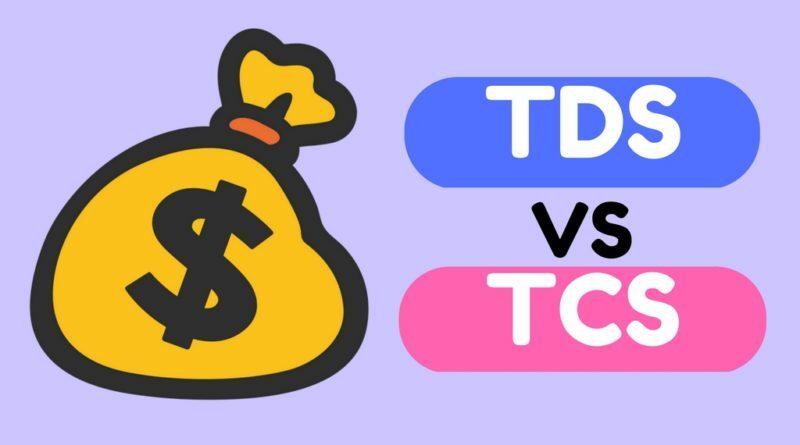 Salaries employees are more familiar with TDS whereas TCS is more known to the people who are in buying and selling businesses of certain goods. This article is mainly focused on communicating the difference between Tax Deducted at Source (TDS) and Tax Collected at Source (TCS). The TDS is the tax which is deducted before the payment of money. It can be explained well with an example of an Employer and Employee. Let us assume that, the salary of an employee is 10,000 Rupees per month but the employee pays only 9000 rupees after deducting 10% tax as per TDS and deposit that 10% amount of 1000 rupees with the government. The TDS is considered as an expense to the employer because the tax paid to the government comes under expense to the organization but not to the employee. TDS is applicable in cases of where payment of salaries, payment of interest, professional fees, lottery amounts, etc and some other items as specified by tax department of the government of India. TCS is a tax which is collected from the buyer by the seller at the time of selling of certain goods which have tax regulations as per tax department of the government of India. For example, The seller sells some goods to the buyer, the seller collects some percent on the sale invoice amount and deposit it with the government in the form of tax. The TCS is considered as an income for the company or seller. TCS is mainly applicable on the specified items like the sale of scrap, sale of timber, etc. TCS is tax collected at the time of payment of money by the buyer to the seller. TDS is the amount deducted before the payment of money by the employer to the employee, payment of rent, etc. TCS is the amount collected at the time of selling specified items as stated by the tax department of the government of India. Tax Deducted at Source is treated as an expense to the company. Tax Collected at Source is treated as an income to the company. TDS is mainly applicable to salary payments, interest payments, rents, the professional fee paid, lotteries, etc. TCS is mainly applicable on alcoholic beverages, forest products, timber selling, mines and quarries, toll plaza, etc. TDS is applicable if the expenses cross the specified limit as prescribed by the tax department of the government of India. TCS is applicable if the sale of the certain goods which are specified by the tax department of the government of India. Mr.A has to pay the salary of RS.1000 to the Mr.B tax rate is 10%, then Mr.A will pay 900 to the Mr.B as a salary and the remaining 100 is deposited with the government. Mr.X sold goods to Mr.Y for RS.1000 and here the TCS rate is 3%, then Mr.X collects Rs.1030 from Mr.Y and he keeps R.s.1000 and deposits Rs.30 with the government. Almost every country in the world have tax systems embedded in their governance and India is one of the countries which follows both the systems of Tax Collected at Source (TDS) and Tax Deducted at Source, whereas many countries in the world only follow Tax Deducted at Source (TDS) system.